Mantra recitation, which is called japa (“muttering”) in Sanskrit, has been an important aspect of Yoga practice since Vedic times. It consists of the repetition of the same mantra, which can be composed of a single syllable (e.g., om) or a string of mantric sounds (e.g., om namah shivaya). As Patanjali reminds us, the yogic path is propelled by practice and dispassion, and significantly, the Sanskrit term for practice--abhyasa—means “repetition.” Through repetition we create either positive or negative habit patterns. Mantra japa produces positive mental tracks, helping us to gradually overcome spiritual darkness. It is a powerful technique for focusing the mind and for harnessing the body/mind’s subtle energies in completing the yogic path of self-transformation. As stated in the concluding chapter of the Kularnava Tantra: “Japa is so-called because it removes the sin accumulated in thousands of lives and because it reveals the Supreme Deity.” The greatest “sin,” of course, is ignorance of our own true nature. Mantras have transformative power. They protect the mind by calling upon and awakening Transcendental Energy. Japa can be practiced aloud, by whispering, or mentally. Mental recitation is said to be the most powerful, but beginners are sometimes taught to audibly voice the mantra or alternate between loud and whispered recitation. Hearing the mantric sound gives the brain helpful feedback for staying mindful and focused. Mindless recitation is unproductive and a waste of time. For countless generations, mantra japa has been practiced with the aid of rosaries of various kinds. These are known as malas, meaning literally “garlands.” Such devices have been employed in Hinduism, Buddhism, Jainism, Sikhism, and also in spiritual traditions outside India, notably Christianity and Islam. Malas can be composed of a variety of materials—wood, seeds, pearls, semiprecious stones, bone, and ivory. The most widely used materials are sandalwood, rudraksha seeds, tulsi seeds (holy basil), lotus seeds, bodhi seeds, rosewood, and crystal. Different materials are thought to serve different purposes in japa practice, but there is no consensus of opinion. Sandalwood and rudraksha seeds of the blue marble tree sacred to Shiva, however, are most widely used. In general, a mala is treated with respect—that is, as a sacred instrument. Some teachers insist that the mala be kept carefully concealed from uninitiated eyes and even that the practitioner use a special bag to conceal the mala when counting or telling the beads. Others recommend wearing the mala around one’s neck, with the guru bead behind the neck. In any case, malas should never be placed on the floor or on seating surfaces. For most purposes the mala is held in one’s right hand, with the beads draped either over the middle finger or the ring finger, and the counting is done with the thumb. The index finger (which is also known as the “threatening” finger) is never used in mala japa. The mala is best held at heart level so that the beads do not drag on the ground. Alternatively, one can rest the beads in the left hand while counting with the right. Some traditions favor the left hand for telling beads, while other authorities allow practitioners to hold the rosary in whatever manner is comfortable, so that the practice does not become a distraction, thereby defeating its purpose. There is clearly great variation in the practical recommendations for using a mala, but ideally it is best to follow the instructions given by one’s teacher. Counting or telling of beads starts with the bead right next to the guru bead and proceeds forward. When the guru bead is reached again, it is not counted or crossed over; instead practitioners turn the mala around and begin the new round with the same bead that ended the preceding round, again moving forward along the mala. This is done out of respect for the guru, who is of the utmost help on the spiritual path. After each mantra, one moves to the next bead. In the case of malas consisting of 108 beads, most teachers allow only 100 beads in the final count in order to take into account any slips or moments of inattention during japa practice. 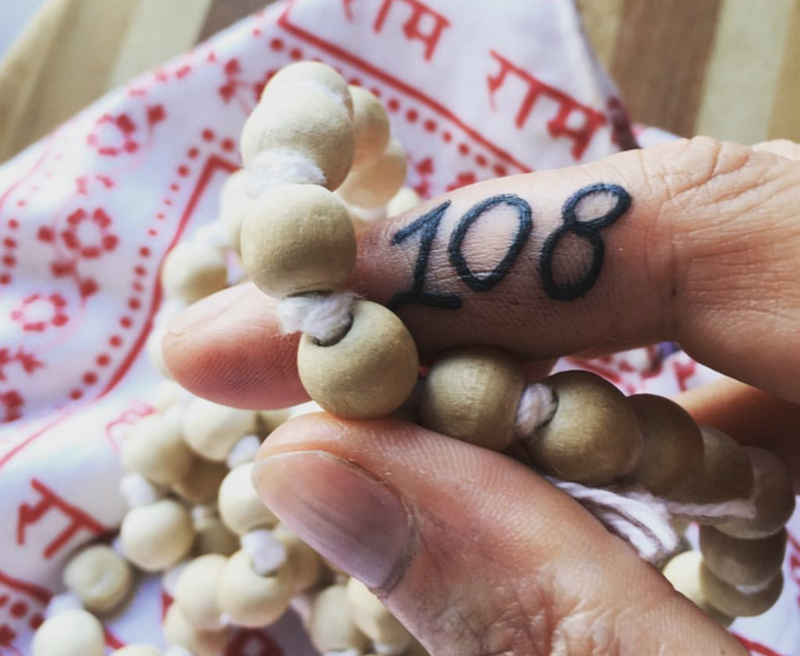 In other words, ten rounds on a 108-bead mala would be reckoned as only 1,000 mantras. Japa, or mantric recitation, is part of many yogic approaches, but it is at the very core of the tantric path of Mantra Yoga. It is based on an esoteric understanding of the fifty letters of the Sanskrit alphabet, which are considered to be fundamental psychocosmic energies. At the human level, they are the “wombs” of language—specifically the sacred Sanskrit language and its mantras. The word mantra is derived from the root “man,” meaning “to think,” and a mantra is said to be a tool by which we can control our thoughts. According to an esoteric etymology, mantra stands for protection (trana) of the mind (manas). The reason why mantras have such incredible transformative power is that they all contain the essential Goddess power—Shakti. They protect the mind by calling upon, awakening, and drawing from the Transcendental Energy, which is the dynamic (feminine) counterpart of Transcendental Consciousness, or Shiva. Having been “seen” or “heard” by Yoga adepts, mantras truly represent and are doorways to the higher Reality. Traditionally, a mantra is empowered only when given in the context of an initiation. In the West, however, this is not always possible, but this should not discourage anyone from using mantra japa. In Yoga it is always the intent that matters. Because mantras are intrinsically expressive of Shiva-Shakti, a well-intentioned mind can always tap into their potency. Thus we may adopt any of the widely used mantras and gain benefit from practicing japa with them. It is advisable to stay with one mantra, however, rather than jump from one to another, which would only dissipate the mantric energy. he work of self-transformation requires all our strength and energy. Mantric “muttering,” or japa, has long been recognized as a formidable ally on the yogic path. Many authorities regard it as the easiest approach, which is especially beneficial in the “dark age” (kali yuga) still in progress today. When we consider how much of our daily speech is wasted on irrelevant things, mindful recitation is most definitely an advisable practice. Georg Feuerstein, Ph.D. (1947-2012), authored over forty-five books, including The Deeper Dimension of Yoga and The Yoga Tradition, and created distance-learning courses on Yoga philosophy and history through Traditional Yoga Studies.